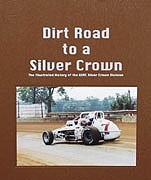 This illustrated the history of the USAC Silver Crown Division covers 27 years from 1971 to 1997. The history of the National Championship, the tracks, the seasons, the Champions, the Owner Champions and a nostalgia piece by Bob Gates. Information on 402 drivers and 96 races in 312 pages and over 800 photos by nationally known photographer John Mahoney.